Good morning everyone :) I'm finally here with a new review! This week was so busy and full of exams but I'm really satisfied! Today I talk about the new mascara plump no clump! by Essence, the orange version. Buongiorno a tutti :) eccomi finalmente con una nuova review! Questa settimana è stata impegnativa e piena di esami ma sono davvero soddisfatta! Oggi vi parlo del nuovo mascara di plump no clump! di Essence nella versione arancione. To sum up, this is a good mascara especially for those who want the eyelashes very long and well separated. In sintesi questo è un buon mascara soprattutto per chi vuole le ciglia molto lunghe e ben separate. And you? Have you ever tried this mascara? What's your favorite mascara by Essence? Please let me know in the comments! E voi? Avete mai provato questo mascara? Qual è il vostro mascara Essence preferito? Fatemelo sapere nei commenti! Grazie mille :) buon fine settimana a te !! Bellissimo! Anche io uso i prodotti Essence! Sono davvero ottimi :) e soprattutto economici ! I've never tried anything from Essence but this sounds great! I'm always looking for a good mascara! You should :) if you want to try a hood mascara I recommend the lash mania !! This mascara sounds amazing! I can really advise the new one from Guerlain as well. Thanks for the helpful review! I haven't really used mascara in a while since it does absolutely nothing for my tiny eyelashes, but I'll probably try this one! I'm yet to try any Essence products but everyone seems to love them! I'm always after a mascara that doesn't clump and this sounds great! This is great, you're right ! As I tell in the comments before I recommend the lash mania by Essence :) it' sooo good !! I love the i love extreme Mascara! Sounds like a good deal for an acceptable price. X! Yes ;) it's very good. Glad you like this review :) If you want the lash mania is good too ! Thanks for the review!! It sounds amazing!! Yes :) it's a good mascara ! Sai che io non ho mai provato i mascara Essence??? Questo mi incuriosisce molto, vediamo se riesco a trovarlo! Very well :) it's so good ! Thank you so so much dear :) have a nice week ! Yeah :) it's very pretty ! Lo consiglio :) è davvero ottimo anche se il mio preferito resta il Lash Mania ! Da quando ho provato lo scovolino in silicone non riesco a farne a meno :) ora compro solo mascara così! Sono ottimi credo che solo questa tipologia riesca a separare perfettamente le ciglia! Sì, è davvero un buon mascara ! I love Essence and it's such a great brand! I have their Lash Princess mascara and it's amazing! I'm agree with you ! Essence has so many good products.. I'd never tried the Lash Princess.. everyone love it ! Ne stavo giusto cercando uno nuovo!!! I have never tried this mascara but sounds great. Mascara it's always a must have ! sai che io della essence non ho mai trovato niente? Davvero? Dovresti provare :) alcuni prodotti sono davvero fantastici ! Soprattutto per quanto riguarda la base: cipria, correttori.. e i loro mascara sono fantastici ! It's a really good brand :) have many products.. and it's very cheap as well ! Thanks a lot Angela :) have a nice evening too ! You're welcome :) it's a really good one ! Great review, lady! I love trying out new beauty products! Me too :) thank you so much Ashley !! Great review! I would def give it a try. Yes :) I really like it ! Thank you for this review, i always love read this kind of things! You're welcome <3 thank you so so much Jordina !! Me too :) I love long and wel separeted lashes ! Grazie mille Susanna :) è davvero un ottimo mascara! Se ti interessa puoi aggiungere alla tua wish list (che grazie ai blog si allunga sempre di più) il lash mania di Essence. Secondo me quello è il migliore del brand ! Great review. I have yet to try out this mascara from essence. Hi, Aisha! Thanks for stopping by my blog the other day:) You have such a nice beauty blog. I never tried this mascara, but I am looking for a new one right now, so I would probably get this one:) Thanks for this review. I'm always looking for good and cheap mascaras to try! Maybe I'll check this one out? Hmmm did you know that the clumpy mascara look is trending right now? Any thoughts? Yes :) you should ! Essence has many different mascaras. Noo I don't.. but I don't like it at all !! non ho mai provato i mascara della Essence, dovrei iniziare! 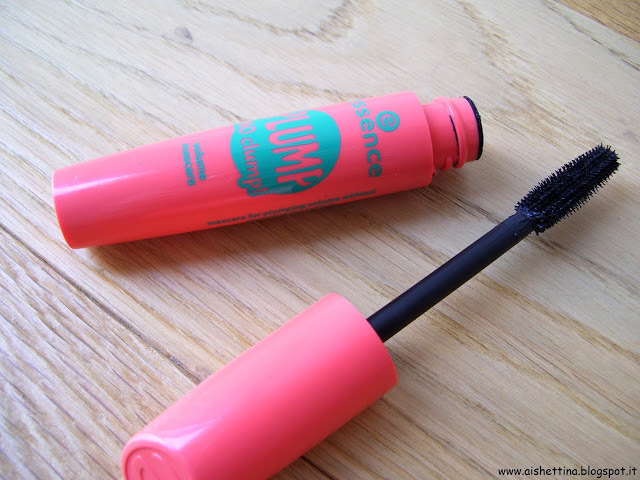 This mascara sounds amazing <3 Thank you for the review! P.S. I've given you a special thank you and shout out on my blogiversary! I'm totally agree wih you! I mean that you have to clean the brush because there is a lot of product on it ! Anche io ho questo mascara! Personalmente lo adoro!